The waterways between Canada and the U.S. have long been a haven and profitable avenue for gangs and other criminals to smuggle anything of value. In another age, Al Capone made his fortune illegally importing Canadian whiskey over the northern border, often using maritime routes. In a recent pilot program, the Royal Canadian Mounted Police and U.S. Coast Guard conducted cross-border maritime law enforcement operations. During these ops, USCG and RCMP personnel embarked on each other’s patrol vessels so that both Canadian and U.S. patrol craft had law enforcement officers from both countries aboard, available to enforce the laws of both countries. Shipriders made 12 arrests and seized more than 200 pounds of marijuana, over one million contraband cigarettes, $38,000 in illicit cash, and six vessels used in illegal smuggling operations. Illegal, unregulated, and unreported (IUU) fishing is a global problem. As fish stocks decline around the world, IUU fishing vessels continue to loot the living resources in the exclusive economic zones of nations incapable of enforcing their own fishing rights. In addition to violating the sovereign rights of coastal states, IUU fishing vessels continue to fish the ocean clean through illegal high-seas driftnet practices. Driftnets, composed of monofilament lines, are effective “curtains of death” that wreak havoc in the oceans. International law has outlawed these driftnets, but illegal fishing continues. The Coast Guard has enjoyed a legacy memorandum of understanding and shiprider agreement with the People’s Republic of China since December 1993, which is routinely put into practice, with excellent effect. For example, USCG Cutter Boutwell participated in a multi-national IUU fisheries enforcement patrol from July through November 2007. Boutwell spent 29 days in a high-threat area and embarked a People’s Republic of China Fisheries Law Enforcement Command shiprider. In the picture at left, the U.S. Coast Guard Cutter Boutwell transfers custody of a fishing vessel to the Chinese Fisheries Law Enforcement Command. The operation “netted” six vessels configured for illegal high-seas driftnet fishing, which were later transferred to a People’s Republic of China patrol vessel for further investigation and prosecution. 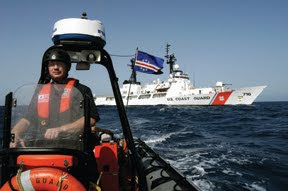 In June 2008, the United States and the Republic of Cape Verde completed an agreement authorizing the USCGC Dallas to embark a law enforcement detachment from the Cape Verde Coast Guard and conduct combined law enforcement operations. Over two weeks, the combined U.S.–Cape Verde law enforcement team conducted extensive operational familiarization, completed six law enforcement boardings in Cape Verde waters, conducted inquiries of several other vessels, and located a suspected drug smuggler’s “station” on a small uninhabited island in the Cape Verde archipeligo. 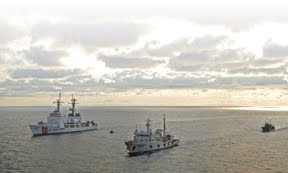 The photo at left shows Chief Petty Officer James Moerls in one of the Coast Guard Cutter Dallas’s over-the-horizon small boats, equipped with a Cape Verdian flag, while en route to conduct a multi-national vessel boarding off the coast of San Vincente, Cape Verde. The “bang for the buck” with shiprider operations is high, and the operations are win-win situations for all participants. As recent Coast Guard shiprider projects have demonstrated, these operations greatly enhance and extend the authority and capabilities of both the Coast Guard and the shiprider partner and further improve the competency of our foreign partners in all law enforcement mission areas.